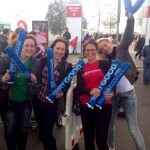 Following our efforts in 2011, 2012 and 2013, Goodgame Studios recently took part in the HSH Nordbank run in the Hafencity area of Hamburg for what is now the fourth time. Comprising 50 Goodgamers, our team was the biggest to represent our company so far. In total, there were 23,244 runners and 812 teams taking part. The proceeds of the charity run, totaling €150,000, were given to the “Kinder helfen Kindern” initiative, who will use it to fund the “Kids in die Clubs” project. All the employees running the race were kitted out with a Goodgame sports shirt, and then it was time to tackle the four-kilometer route together. Our team got off to by far the loudest start, and the commentator was friendly enough to remark that we are always looking for new employees, and that anyone who had their application with them was welcome to give it to us.